Town have announced the season-long loan signing of Jordan Graham from Wolverhampton Wanderers. Graham was previously briefly on loan with the Blues in the 2013/14 campaign. Reports in the Midlands linked Town with a move for the winger earlier this month after a switch to Wigan broke down. “I enjoyed being here before but I was very young and it was a big step up from academy football to playing in the first team,” Graham told the club site. “I’m bigger and stronger now and feel like I’m in good physical condition. I’m ready for the challenge here. “When I got the go-ahead to say the deal was done I couldn’t get down here quick enough. “I know Chambo and Skusey from my time here before and I know a lot of the other lads as well. That always helps to settle in. “It’s a big year for me and I’m here to make my mark. I want to score goals, I want to get as many assists as I can and I want to play my part in helping the team finish as high up the table as possible. “I’m buzzing to be part of it here and it’s a great game to start with, the derby on Sunday. “I got to know about the rivalry when I was here first time and how important the game is to the supporters. The former England U16 and U17 international, who represented the Republic of Ireland at U15 level, has been among a number of players not training with the Wolves first team squad recently, along with Dominic Iorfa, who was on loan at Town last season. Graham, 23, spent a short spell on loan with the Blues from Aston Villa in late 2013 when he made two substitute appearances. 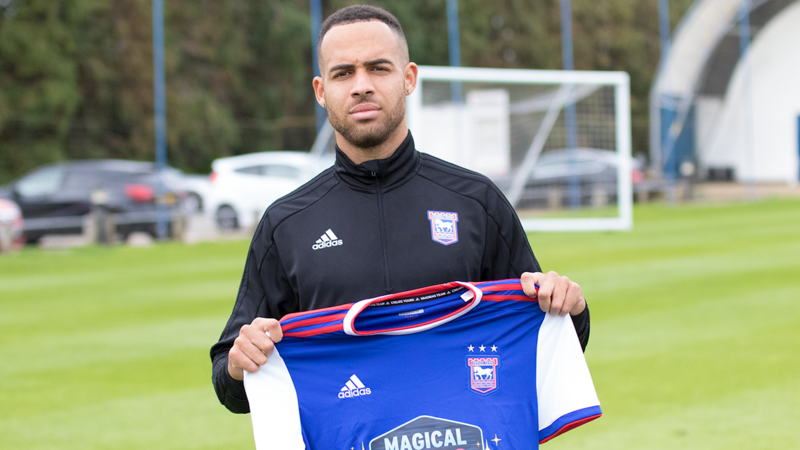 Following his short stint with the Blues Graham, who will wear the Town number 14 shirt during his second spell, moved on to Bradford on loan without making an appearance and then Wolves, who he joined on a permanent basis in 2014. During what's been an injury-hit spell at Molineux he spent time on loan at Oxford and moved to Fulham on loan for the whole of 2017/18 but made only three sub appearances for their senior side. In total since his spell with Town, Graham has made only 18 first team starts and eight sub appearances. Despite Graham's lack of games, Wolves took up an option to extend his contract to the summer of 2020 in May, largely so as not to miss out on a potential fee if and when he is sold. Happy to strengthen. Tilt before Sunday please! 18 games in 4 years???? Can't remember him doing much here before and he's been injured for most of the time since but hopefully he will add something for us. A goal on Sunday would go a long way! We really need to get a CB in as soon as possible now in case Toto's red card isn't overturned. Hard to get excited about this. I was hoping to see some proper Championship experience coming in. Jon Walters would have been nice but I assume we would have got nowhere near his wage demands anyway. A debut goal on Sunday will change my mind! Had a bad knee injury in 2016 & had hardly played a game since. We must be somewhat desperate! Oh dear oh dear.. if this is the calibre of player we are now attracting league 1 is an absolute cert! EVANS OUT!! Was an absolute non event last time he was here. Lets hope he hits it off this time. I really am trying to stay positive, but who? Striker and centre back is priority. Looking real desperate now. Please prove us wrong! Wow. So much for Jordan Roberts. What a strange signing. While in conversation with the Wolves sales department, an enquiry about the avilablility of Danny Batth would not have gone amiss. Unless a deal for Tilt is pretty much sorted, as has been reported, Batth would be a very decent addition in terms of ability, experience and presence. Looks like Jordan Graham and Gwion Edwards will be our main 2 wingers for the season. both are comfortable playing on either side , i can see them swapping alot in games depending on how games are going and how much success they are having against oppostions full backs. Underwhelmed. Really, is he better than what we currently have? Worried now. Not looking good if this is the best PH can come up with! Hope he's free or pay as he plays. Need striker and left CB are priorities surely. We already have Rowe and Roberts , plus Ward , did we really need another winger ? Given our poor start to the season, do we need another loanee ? Where have all our so-called promising youngsters gone and why aren't they playing ? Good player on football manager. He loves his wingers and is obviously thinking about creating more supply for Harrison / Jackson / whoever is up front. Goals after all, win games. Get Tilt in then we are doing ok.